Although blockchain is promising disruption across a range of industries, there are still pain points which are preventing the technology from working alongside legacy financial systems effectively. What seems to be missing is a financial operating layer to connect the dots, and bring the world of traditional finance and blockchain technology together. That’s precisely what one blockchain startup from Singapore is working towards with its new blockchain platform, which it believes will become the operating system for cryptofinance. Blokt interviewed John Liu, Chief Product Officer at the Fusion Foundation, to learn how Fusion is enhancing financial interoperability and changing the way tokenized assets are created, distributed and exchanged. The Fusion Foundation was founded in early 2018 in Singapore, after successfully raising over $50 million through a token sale which concluded in less than 24 hours. Following a rapid expansion during 2018, the Fusion Foundation now has offices in Shanghai and New York. Dubbed the world’s first open-source cryptofinance operating system, the Fusion Foundation is specifically designed to facilitate seamless value transfer of digital assets, via connected blockchains and even through off-chain legacy financial systems. Reducing reliance on intermediaries for issuers, investors and borrowers, and reducing siloed information. Increasing access to primary issuance and secondary market investment opportunities for willing investors who may lack market access or awareness. Reducing the costs of regulatory compliance to meet auditing and reporting requirements. The Fusion operating system will eliminate the need for third-party participants such as clearing houses or lawyers, create more efficient peer-to-peer asset swaps, and significantly speed up and reduce the costs of cross-border transactions. 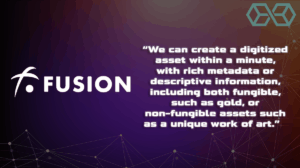 Fusion offers easily executable financial transactions within a connected marketplace, from the moment of asset creation to listing on a secondary exchange marketplace; facilitating a wide range of asset creation within the Fusion network. The Fusion protocol allows for an exchange of value between different assets through its “Quantum Swap” functionality, which enables users to create orders for swapping assets, defining their preferred exchange rate, controlling the fill behavior, in addition to setting the privacy of orders. Additionally, Fusion’s protocol facilitates new transactions based on the time-dependent value of money, which brings a greater level of financial sophistication to many assets. Through this feature, called Time Locking, Fusion users can divide the value of the underlying asset into different “time-slices,” then trade the resulting time slices on a secondary market. Users of the Fusion protocol can create derivatives of assets, such as futures or forward swaps, and subsequently, transform any asset into collateral for debt instruments such as mortgages or auto loans. Time-based transactions, for example, rentals or software licenses, can also be created on the Fusion protocol. Trustless transactions have the potential to remove intermediary costs and provide a robust data store. Fusion’s decentralized solution allows for two parties to engage in a deal without the need for guarantors, transfer agencies, and other third-party validators or facilitators. The chain network itself serves as the enforcer and auditor of the transaction. Furthermore, data is shared and stored across the entire system, which prevents centralized loss of information or attacks on centralized data stores to fraudulently manipulate transactions. Interoperability between different blockchains, and between blockchains and off-chain legacy financial stacks, is one of the last significant hurdles of widespread blockchain adoption. Liu added that one of the most significant drawbacks of most interoperability solutions is that they fail to give control of digital assets on external chains SECURELY by storing private keys in a centralized manner. Instead, Fusion utilizes its “Distributed Control Rights Management (DCRM)” technology, which enables users to control their assets across external blockchains – and even within off-chain legacy financial systems – by sharding private keys across nodes so that no unauthorized transactions can ever take place. Building the world’s first financial operating system requires a broad technology stack with multiple features working in parallel. We asked Liu what the current core components of the Fusion protocol were, and how they worked in synergy with each other. The PSN is Fusion’s secure live beta “sandbox,” a fully functional Fusion Network in a staged testing environment. The PSN is a risk-free environment which uses the “P-FSN” test tokens for testing network functionality, including Quantum Swap, Time-Lock, FSN staking and more. The PSN gives developers on the Fusion network an opportunity to learn the ropes before the Fusion mainnet goes live. Although Fusion’s smart contracts are still under development, the team is promising cutting-edge innovation in this area too. For smart contracts to reach mass adoption, it’s essential they can be easily created, and Fusion is working towards this goal. As briefly discussed, Fusion has developed the DCRM in an effort to solve one of the blockchain community’s most significant hurdles, interoperability. Fusion accomplishes this by using a decentralized approach to security. User private keys are split into individual shards and then distributed to nodes within the network. The private key is then reassembled when transaction signing takes place. The FSN Token is an ERC-20 utility token. Currently, participants of the Fusion PSN, are using FSN tokens to test the functionality of the Fusion open-source protocol. PSN testnet users can swap and lend non-value test FSN tokens, which are digital representations of traditional crypto assets or physical assets. In March, the FSN token was listed on the China-based exchange CoinAll, as well as South Korean-based exchange UPbit. We asked Liu what Fusion’s thoughts were on the future of tokenized markets. Liu believes that the first wave of assets to be tokenized will be those that don’t rely on central exchanges. This includes assets such as real estate, fine art, and intellectual property, all assets which are currently in the early stages of proving the merits of eliminating intermediaries. Other assets which Fusion believe will be the first to undergo tokenization include underserved investment areas, such as SME businesses or auto-loans, which have historically suffered from lack of funding options or transparency. Building on the prospect of new tokenized markets, Fusion has announced a partnership in February with the Automotive eXchange Platform (AXP), to build a blockchain-based platform solution to power auto-backed loans and reduce fraud. Liu also hinted that Fusion has formed a global alliance with several established players in the blockchain space to test stable-coin use cases for a network of banks, but it is not at liberty to disclose more information at the moment. Fusion was recently recognized as the “Most Valuable Project” at the World Blockchain Security Conference (WBSC) February 2019, held in Shenzhen, China. The conference, which gathered more than 200 industry elites, high-net-worth entrepreneurs, blockchain innovators, cryptographic scholars, and technologists, is one of the most anticipated industry and blockchain technology events in China. Fusion’s CEO, DJ Qian, has also been selected as a keynote speaker at New York’s Digital Asset Summit on May the 15th, where he will be sharing his visionary perspectives on the future of cryptofinance, and the adoption of blockchain technology within the financial industry. The Digital Asset Summit, part of the wider Blockchain Week, is dedicated to financial market professionals and brings together 500 of the most influential fund managers, banks, family offices, regulators, CIOs and blockchain innovators. Overall, Fusion has a clearly defined plan for the future of its crypto-financial operating system, and a strong technology stack to deliver its vision. Fusion Is Set to Facilitate the Future of Crypto-Finance With Its Blockchain Operating System was originally found on Cryptocurrency News | Tech, Privacy, Bitcoin & Blockchain | Blokt.